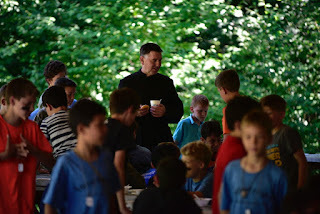 John had the most wonderful and fruitful time at Montfort Boys' Camp this summer, his second time there. His dad went along to New Hampshire to volunteer at camp in the kitchen and as a General Dad Helper--which once involved making habitats for the eight-year-olds who had caught some rust-colored newts! This year, my heart wasn't in the pit of my stomach all week, both because it was not the first time I'd been apart from my firstborn for such duration, and also because Chris had cell coverage this year! 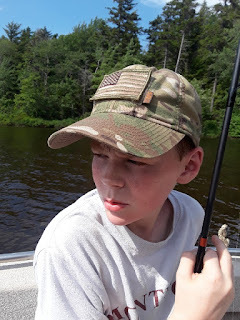 Last summer, I anticipated getting through the lonely week by receiving many text and photo updates of my boy, so was disappointed to discover--through silence--that Chris had virtually no cell coverage. 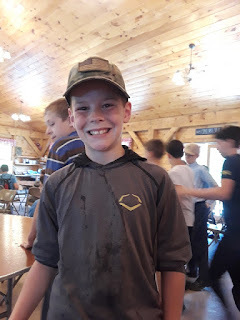 But this year, he happened to have switched his phone and company, and that meant he had good coverage up at camp: yay for Mama! 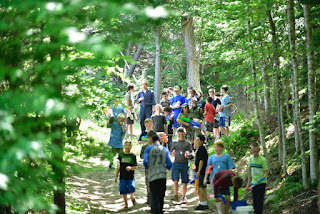 Montfort Boys Camp takes its name and spirit from the great Marian apostle, Saint Louis de Montfort. 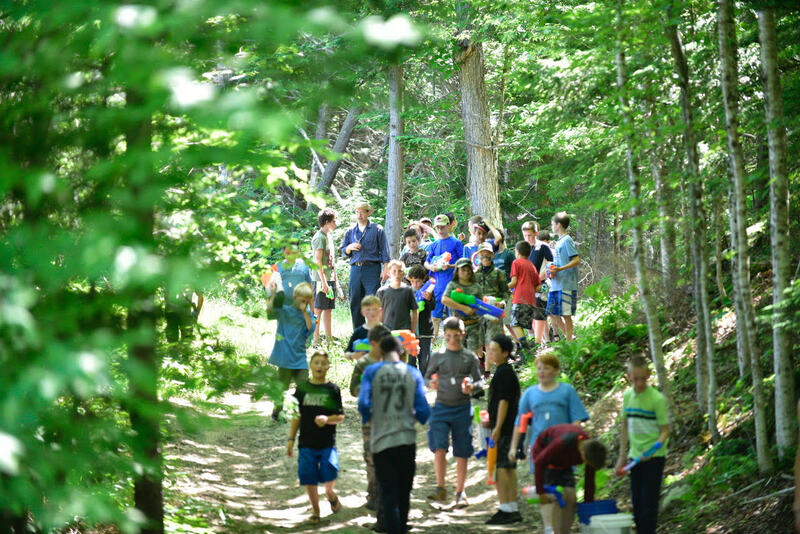 Under the direction of the Slaves of the Immaculate Heart of Mary Brothers, Montfort Boys Camp provides one week of wholesome outdoor activity for young men in a traditional Catholic environment. At Montfort, the Faith comes first. As an extension of the Brothers’ apostolic efforts, the daily schedule fosters a deeper appreciation of the spiritual life through morning and evening prayers, the Latin Tridentine Mass and the Holy Rosary. The program also includes faith-building religious instruction and an emphasis on the importance of virtue and discipline. The Slaves of the Immaculate Heart of Mary Brothers have directed Montfort Boys Camp for over 20 years. 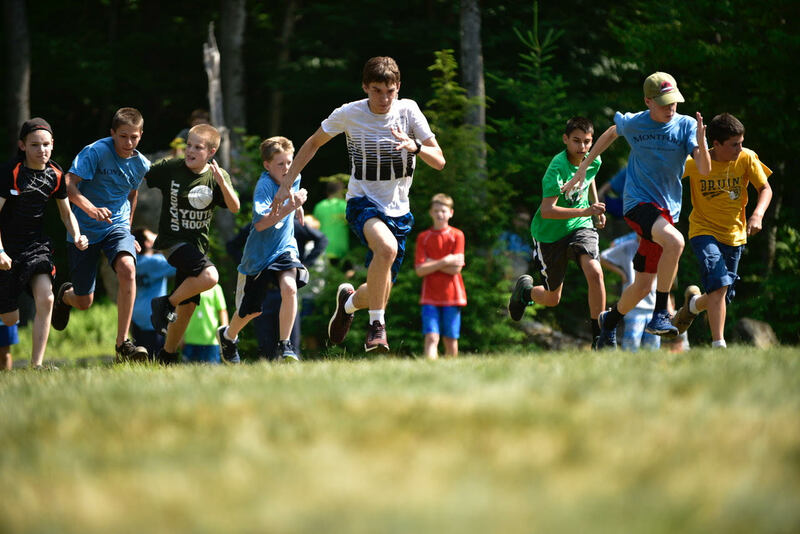 The Brothers live a life of True Devotion to Mary in the Spirit of Saint Louis Marie de Montfort, and extend their apostolate to young men each summer during a wholesome week of physical and spiritual activity at Montfort Boys Camp. 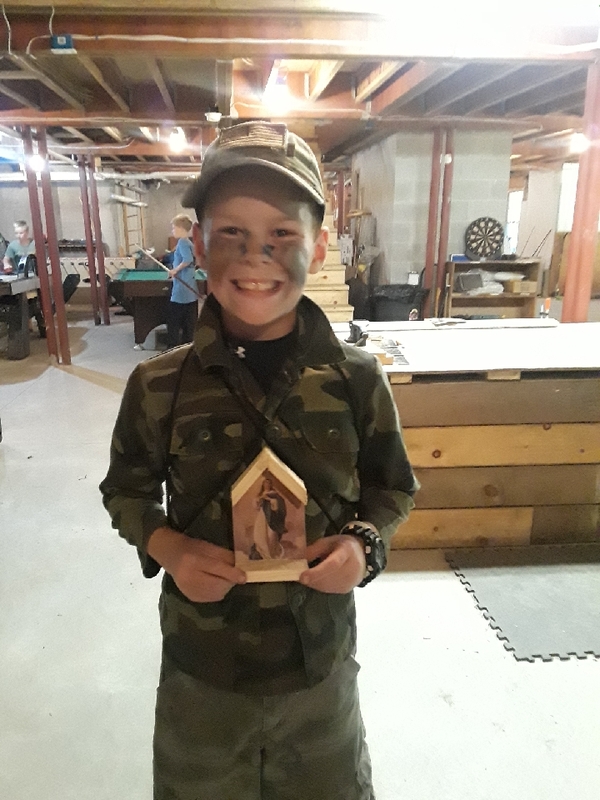 Daily religious instruction • Latin Tridentine Mass • Camping in 8-man cabins • Daily inspections • Sailboating • Hiking • Swimming • Arts and Crafts • Canoeing • Boxing • Fishing • Archery • Sports • Campfires • Achievement & Good Conduct Awards • Guest speakers …and more! 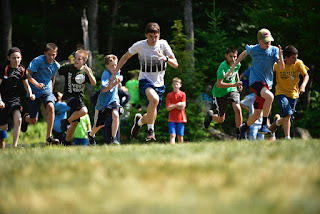 The days at camp are structured with numerous anchor points, such as starting every day with Mass and jogging, the various meals, the mid-day prayers, and the evening catechism around a campfire. 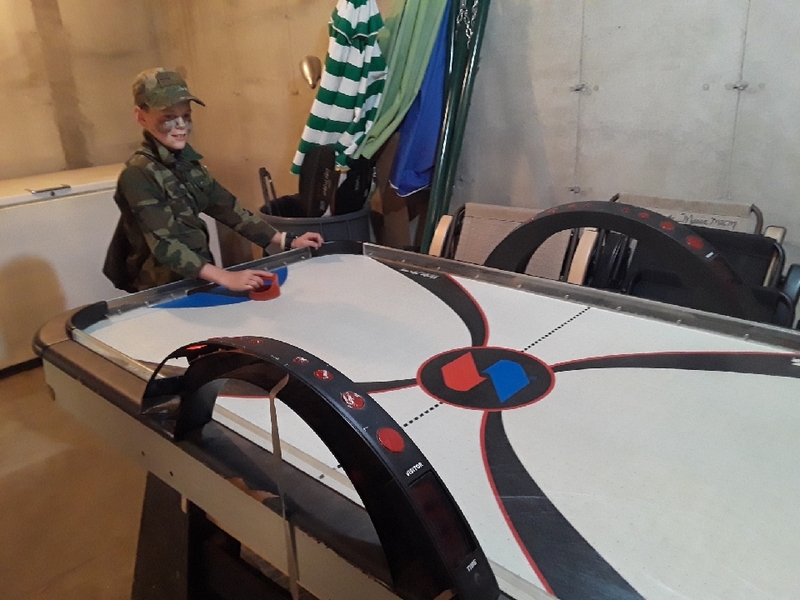 In between structured events is a lot of free time during which the boys--77 of them, this year--run around in freedom, spending time at the various stations manned by Brothers and volunteering fathers. 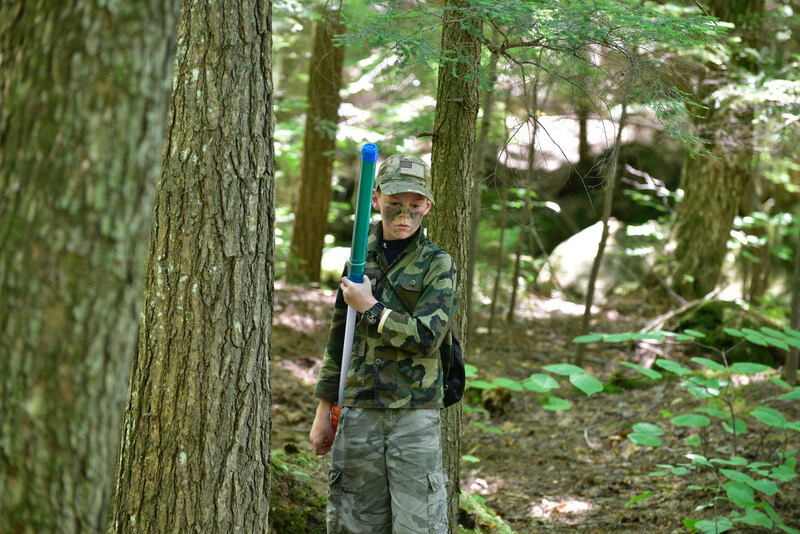 John seems to be most passionate about fishing and shooting, and this year discovered the satisfaction of woodworking. He made his mother a small Marian shrine (which she treasures), and made himself a large shrine he intends to hang on the wall by his bed so he has a shelf for religious objects and hooks for hanging rosaries. John also bought gifts for his siblings with his own money: treasured rubber lizards for his two littlest brothers, and beautiful rosary purses for his younger sisters. And Chris brought me a book about the "Apostle of the Rocky Mountains"! The cabin John ended up in was full of good fellow 11-year-olds. They developed a routine of going to bed right away (lights out was between 10:30 and 11:00 after they wear these kids out with routine and recreation), and then choosing to wake up at 5:30 in order to play cards or other games before 7:00 Mass. John organized this daily recreation, dubbed Morning Game Time, and it sounds like the boys really appreciated it. John developed a poison ivy rash mid-way through the week, but it turns out he did not encounter the enemy plant at camp. Instead, he touched the plant the Saturday prior when he and friends went to a dairy in Massachusetts for ice cream and there were tearing up and feeding poison ivy to the friendly local goats. Most of the kids in our friends' family, as well as John, developed the terrible rash. Let's just say I thank God for the modern medicine of internal prednisone! When the fellows arrived home, I had them leave all their belongings in the garage and I'm going through it today according to the best directions I can find, while garbed in long sleeves, long skirt, long leggings, and wearing disposable gloves. I'll know in about three days if I've gotten through this process without developing the rash myself! Back at Montfort . 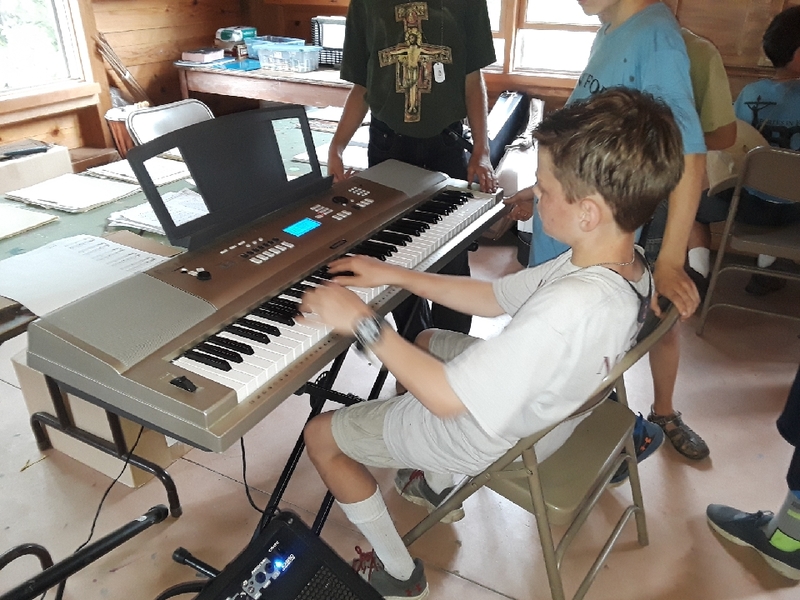 . . there were too few acts for a Talent Show this year--so disappointing out of 77 boys!--so the Brothers organized instead a Montfort's Got Talent night, in which kids just got up and entertained the others, without judging and prizes. John had been acting in a play, written by one of the Brothers, all week, but, for a reason unknown, it got cancelled, so he played piano instead. Still, he got the enjoyment of acting, which is right up his alley, in a holy but fun production! 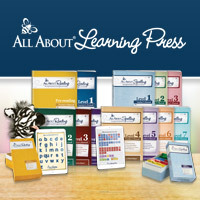 Fellow moms, let me encourage you: our children are listening! This is for good or for ill, depending on what we parents are saying and showing by example, but in this case: good! I think this particular child is not listening to me with my schedules and routines, charts and lists. Yet, while he traveled, he did such things as make a Shoe Area at the home he stayed at last Saturday--my family knows that when we show up at a hotel, the first words out of my mouth are, "This is the shoe area! Put all your shoes here!" He got to his cabin and made a welcome sign for fellow boys, "Welcome to MBC" (Montfort Boys' Camp). And, my favorite, he made a schedule for daily cleaning duties for himself and his cabin mates, to be completed before daily inspection by the brothers. Be still, my mother's heart! The cleaning schedule made by my son! 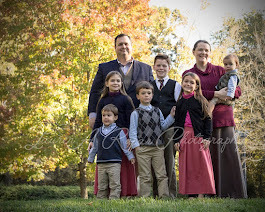 Having my husband and oldest helper gone for 11 days was a real sacrifice--but, hey, at least I wasn't eight months pregnant like last year!--and I would wonder at times if this were really worthy any character development and holy growth in John. I can say yes. I am hearing so many stories from both John and his Dad about events that happened that make my mother's heart soar as I can see the lessons we've been imparting for years starting to bear fruit in new, more mature ways. I wish I could share such stories, to give encouragement to mothers along the path, but it feels to me that sharing stories of my son evangelizing, or making the right choice in adversity, or resisting bad peer pressure, or reaching out to another child, or admonishing a sinner in a gentle, loving way, or bringing the light of Christ to someone is somehow more private than, say, sharing a piano video of his playing. Yet, it is these character developments that are the best and more important accomplishments, more so than a name appearing in lights or a prize earned. Now I'm getting to enjoy my son talking my ear off at every opportunity, telling me stories, adventures, and starting to ask questions as he is being exposed in slow and safe ways to other ways of life outside of our bubble. I love listening to him!